Federal tax credits can help you save a bundle with when you purchase a Solatube Daylighting System or Solar Star® Fan. 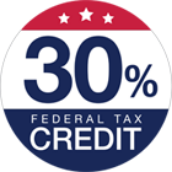 Both the Solatube ISn Daylighting System and Solar Star Fan qualify for a 30% federal tax credit because of integrated solar-electric technologies. Other Solatube Systems, including the Smart LED, may qualify for a 10% tax credit because of ENERGY STAR ratings. Decorative Fixtures are included, as they’re an essential part of the system. Add-ons, such as the Ventilation Kit, Daylight Dimmer, and Light Kit are excluded.